On Sunday Japan’s Defense Ministry released a new aerial video (embedded) of the Fukushima Daiichi nuclear power plant, which shows the damage to the reactors closer and more clearly than previous footage. This is only the second package of aerial footage of the plant to be shown to the public since it was damaged by the earthquake and tsunami. The footage was shot from a Ground Self-Defense Force helicopter, and shows the ceiling of the reactor number 1 building that collapsed in a hydrogen blast. 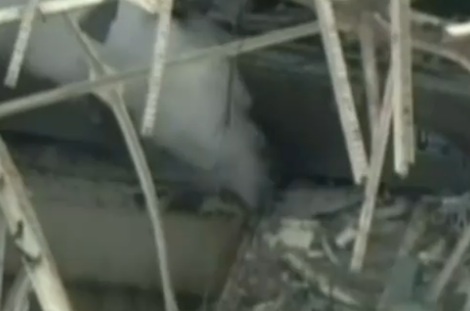 White vapor can be seen rising through several holes in the roof of the number 2 reactor building. The roof of the number 3 reactor building was also blown off by a hydrogen explosion and steam can still be seen rising from inside. The walls of the number 4 reactor building have collapsed, exposing what seems to be a crane and a ball-shaped yellow structure. Steam is flowing out of the building. TEPCO has said plutonium has been found in soil samples from the Fukushima Daiichi nuclear power plant. The company has said levels detected do not represent a threat to human health. Plutonium is a byproduct of the nuclear power generation process. The Nuclear and Industrial Safety Agency has said the detected level is the same as that found in the environment and not health-threatening for workers who conducted the sampling, nor residents in surrounding areas. The agency said it is waiting for results of another survey by the Science Ministry outside of a 20-kilometer radius from the plant, as well as a further survey by TEPCO in the plant compound. Three workers exposed to high levels of radiation at the Fukushima Daiichi nuclear power plant have left hospital with a clean bill of health. The three workers left the National Institute of Radiological Sciences in Chiba Prefecture on Monday, after receiving special treatment for radiation. Japanese authorities have said high levels of radioactivity in water leaking from a reactor resulted from a partial meltdown of fuel rods. Contamination of a pool of water in the turbine building of number 2 reactor was found to be 100,000 times normal levels, TEPCO has said. Radiation above 1,000 millisieverts per hour was also found in surface water in trenches outside reactor number 2. TEPCO said it could not rule out that radioactive water has seeped into the ground, although the trenches do not lead to the sea. Radioactive iodine-131 at 1,150 times the maximum allowable level had been detected in seawater near drainage outlets of four Fukushima reactors, said Japan’s Nuclear and Industrial Safety Agency (NISA). A Greenpeace radiation detection team has said that it has recorded radiation levels of up to 10 microsieverts per hour in Litate, a town 25 miles from the plant, and demanded Japanese authorities increase the evacuation zone. Four of the six Fukushima reactors are yet to be made safe. Efforts are continuing to prevent a full meltdown.